Forget about a campaign “reset” from the Obama camp, Thursday evening, or anytime during the next twenty-odd days until the election results are final. Forget about the hand wringing and the forget about being nostalgic for September, when Romney was on the ropes. 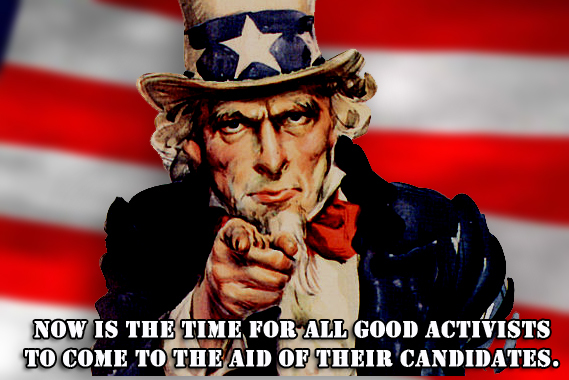 Now is the time for all good activists to come to the aid of their candidates. It’s not only because it’s the candidates for vice president who will be debating that makes tonight’s debate relatively meaningless. It’s because of how close the polls are, and how the fickle undecided of the electorate decide to move the few points difference in those polls. There are no more bumps in the polls – only nudges. To be sure, the pundits will praise the debate “winners,” talk about a campaign getting its mojo back or having “the big mo'” heading into election day. But barring any major meltdown, we are neck-and-neck in the home stretch, and the race will only be won or lost by the strength of the tail wind the respective bases provide. Americans fought the headwinds of voter ID laws, and have won those – for this election, anyway. Progressives have fought the headwinds of the insane amount of money that came pouring out of the Citizens United decision, and may have at least reached a push, due in no small part to the imperfections of and dissatisfaction with Romney as a candidate. Even though we may fall into our couches are armchairs every night, and listen to political color commentary on CNN, MSNBC, Comedy Central or Fox, remember that elections are not a spectator sport. Victory does not rise and fall with the opinions of the pundits. It is up to us. We are not just the twelfth man in the stadium screaming loudly when the opposing team has third and long; we are on the field lifting our own team on our shoulders and carrying them across the goal line. That is the strength of the American political process – that we don’t win just by being interested; we win by being involved, whether with money, with sweat or with service. So after the debate tonight, regardless of who is declared the winner, make a list of just five things you can do between now and election day to help your candidate and your party to victory – just five things: 5 people to call; 5 donations to make; 5 days to commit to your local campaign office. It really is up to you. It always has been.